Staying calm and taking responsibility are some of the keys to success both inside and outside of prison. But sometimes it takes more than a person to teach that. Meet the dogs of Wildwood Correctional Center in Kenai. Taz followed the commands without uttering a sound. Rogers and Taz match. They’re both large and bulky and calm. This was always true of Taz, who is half Great Pyrenees and half mastiff, Rogers said. But this was not the case for Rogers, who experiences some mental health challenges. He and staff said having Taz around for the past seven months has made Rogers more patient, calm, and responsible. He said he’s even kept his cool at the most trying times, like when the dog accidentally broke the TV he saved up for 6 months to buy. It was frustrating, but he knew 114-pound Taz didn’t mean it, so he learned to forgive. The Special Pet Obedience and Training program started at Wildwood in 2013 and was modeled after one at Hiland Mountain Correctional Center in Eagle River. A similar program recently started at Spring Creek in Seward, and nearly 300 exist nationwide. The dogs are rescue animals, and inmates pay for the animal’s food and medical care themselves by selling things like food and personal items to other inmates through internal organizations. Most research on dog training programs in prisons, including a large analysis published in the Prison Journal, shows that they have positive impacts on inmate behavior and help them increase their self-control. That’s the effect dog training had on Jonathan Norton, who learned to work with the animals when he was an inmate at an Arizona prison years ago and is one of the main trainers at Wildwood. Norton said he calmed down and settled the dispute with the other guy without fighting. Now he uses the ideas he learned for training dogs when working with other people. Wildwood superintendent Shannon McCloud started the program because she wanted to keep people busy, and she loves dogs. She said having them around makes everyone happy, including the staff. She’s seen how the dogs can completely transform inmates, which improves the overall environment in the prison. Research supports McCloud’s observations, too. 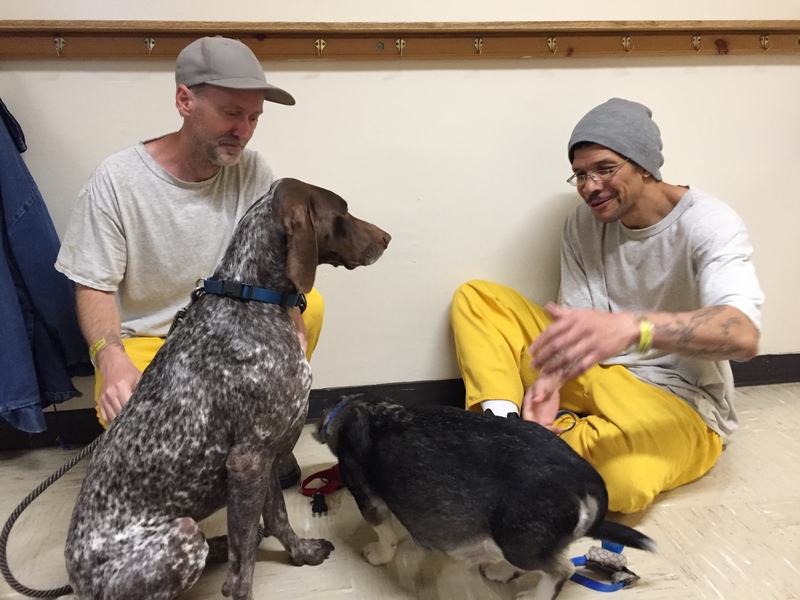 Though studies on the programs have limits because of the small sample sizes and few control groups, they found that dog training in prisons reduces recidivism and improves the behavior of long-term prisoners. Rogers says there are some drawbacks to sharing his tiny cell and single bed with his giant friend. But Rogers said he understands how to treat people now, and he’ll be different if he’s released. And, he learned it all from his dog.